Now you can enjoy the conveniences of banking at a traditional branch by using our Virtual Branch services for all of your personal banking needs anytime and anywhere! We offer these e-services to ensure that you can engage in banking in a way that meets your needs. With our extremely convenient Virtual Branch many of your banking tasks – whether checking your accounts or even transferring funds – can now be done on your schedule from the comfort of your home. 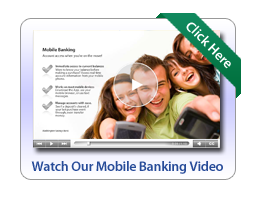 Mobile banking is a part of our Virtual Branch that lets you access all of your accounts and pay bills anytime, anywhere, with your mobile phone/device. Better yet, it’s free! You can check balances and history as well as set up alerts through text messaging. Sign up for our WSB Mobile app as well to access all of your account information directly from your smart phone or tablet. Go to your Online Banking account on a personal computer, not a cell phone. If you don’t have an online banking account, call us today to get started! Click on ‘Enroll Now’ under the ‘Mobile Banking Profile’ option. It’s that simple. If you have any questions, please give us a call at 217-347-7173. 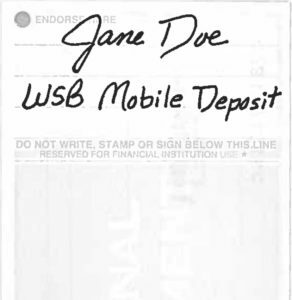 With the WSB Mobile app, you can take a photo of your check and make a deposit anytime, anywhere! The deposit per check limit is $1,000.00 with a daily limit of $2,000.00. (Each check is one deposit). Before logging into the WSB Mobile app, close all other apps running in the background on your mobile phone. Once logged into the app, select the deposit icon from the menu across the bottom. Tips for taking pictures of the check. Keep the check within the view finder on the camera screen when capturing your photos. Try not to get too much of the areas surrounding the check. Take the photos of your check in a well-lit area. Place the check on solid dark background before taking the photo of it. Keep your phone flat and steady above the check when taking your photos. Hold the camera as square to the check as possible to reduce corner to corner skew. Make sure that the entire check image is visible and in focus before submitting your deposit. After the Mobile Deposit has been accepted and “Deposit Pending” shows up in Mobile Banking, the deposit will appear in your account after the nightly update. An easy and convenient way to pay both regular and one-time-only bills, without having to visit the post office or buying stamps! Make banking with us easy. View and access your checking account(s) online. Kasasa Cash® is a free checking account that pays you interest in cash every month with no minimum balance, no monthly fees, free online banking and up to $20.00 in nationwide ATM fee refunds per monthly qualification cycle when qualifications are met. Open Kasasa Cash Account Now! Forget about collecting thousands of points to redeem for things you don’t really need. Our FREE Kasasa Cash Back® checking account will reward you with 3% cash back on up to $250 in everyday debit card purchases when qualifications are met. Open Kasasa Cash Back Account Now! Looking for something to sing about? Kasasa Tunes® is a free checking account that lets you earn $10 each month in iTunes®️, Amazon.com®️ and Google Play®️ refunds when qualifications are met.  Open Kasasa Tunes Account Now! View and access your savings account(s) online and watch your money grow. Kasasa SAVER® is a free, high interest savings account linked to a Kasasa checking account that earns interest and puts savings on autopilot. It’s perfect for consumers who want to automatically save more and save often. Open Saver for Kasasa Cash Account Now! Open Saver for Kasasa Cash Back Account Now! Apply for a loan online. Application typically takes less than 20 minutes. Send money to another person with a simple email or text with Virtual Branch account. To send a payment, consumers sign into their online account and enter the recipient’s email address or mobile number and the amount of the payment. You’ve got money! The recipient receives an email or text with a personal greeting from the sender. If the recipient’s financial institution is in the Popmoney® network they use their online banking application to accept the payment. If not, the recipient tells Popmoney.com where to deposit the money. Money moves directly from sender’s to recipient’s bank account. Popmoney® uses the same network the world’s financial institutions use to move billions of dollars a day. Use Popmoney® to pay anyone you know, or owe – It’s the easy way to send and receive money directly from your Washington Savings Bank account. Pay your babysitter or send money to a relative – anytime, anywhere. From the moment information is sent to Popmoney® to the time it is stored and accessed again, it is encrypted using industry leading software and algorithms. Security is also utilized at specific points and actions in the product. For example, to help prevent an unauthorized person from fraudulently depositing someone else’s payment, one-time passcodes are used. For every initial payment to a new email address or mobile phone number, a one-time passcode is sent to the user. The user must provide that passcode back to Popmoney® to verify his/her “ownership” of that mobile phone number or email address before he/she can deposit the payment. How fast can I send and receive money with Popmoney®? With Popmoney®, a recipient can receive money in as little as one business day. However, in some cases it may take longer. For example, if you send an email or mobile phone number and the recipient is not yet registered for Popmoney®, he/she must sign up for the service so that we have their account information to deposit their payment. Also, if you exceed your next-day payment limits, then we will deliver payments within three business days. Limits can and will vary and can be checked by clicking the Help icon on the Send Money screen. Sign up for eStatements and help save the environment. Receive notification that your bank statement is available to view. You can either click on the link in your email notification or log on to online banking and click on the account and then the documents tab. Available for any checking account and Tiered Statement Savings Account. Transfer money easily from one account to another. Apply for a VISA® Platinum Credit Card that rewards you with points. Escrow/Contract for Deed – Washington Savings Bank, Trust Department serves as a third party Agent for individuals entering into a real estate contract with another party. Directed Agency – This type of account allows us to assist you with paying bills, such as utilities, insurance and taxes, etc. You can also add investments such as stocks, bonds, CDs & mutual funds, which we buy and sell at your direction. 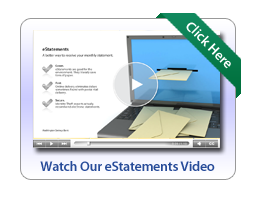 We provide you with a detailed account statement at the frequency you desire. Personal Investment Custody – Are you confused about what type of investor you are? Allow us to help you determine that. We can provide an investment proposal for you to review. All buys and sells of investments are done at your direction only. We provide you with a detailed account statement at the frequency you desire. 1031 Exchange – The exchange of certain types of property may defer the recognition of capital gains or losses due upon sale, and hence defer any capital gains taxes otherwise due. The properties exchanged must be of “like kind”. Contact us for more information. Trusts are designed to fit your family's needs. Special Needs Trust – Individuals with children or loved ones who have disabilities are able to create a Special Needs Trust that leaves money for care while still allowing the person to receive governmental aid. A great Estate planning tool. 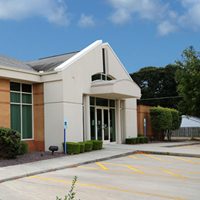 Land Trusts – An Illinois Land Trust is a mechanism used to handle ownership in real estate. Revocable Living Trust – Transfers property from a living grantor, or creator, to a trustee through a written agreement. A Revocable Living Trust allows the grantor(s) to change the terms whenever he/she wants. You can be your own Trustee while living then appoint a Successor Trustee to serve after your death. Irrevocable Trust – Often used for asset-protection purposes and qualification for VA and Medicaid-paid, long-term care benefits. A properly drafted trust will ensure you do not have to surrender all control. Testamentary Trust – Established from the last will and testament that provides for the distribution of all or part of an estate and often proceeds from a life insurance policy held on the person establishing the trust. There may be more than one testamentary trust per will. A trustee to administer the trust would be named in the will. Self-Directed IRA – Contribute to an IRA, or transfer an existing IRA, to keep your retirement assets deferred from income taxes. Do you have retirement funds in a prior employer plan? A direct rollover will allow you to keep those funds tax deferred. You are able to invest in stocks, bonds, mutual funds & CDs, all at your direction. SIMPLE IRA – Are you an employer who would like a simplified way to contribute toward your employees’ and your own retirement savings? Contact our trust department for information. Roth IRA – A great tax-efficient way to save for your retirement. You pay taxes on money going into your account and then all future withdrawals are tax free once qualifications are met. We’d be happy to help you determine if a ROTH IRA is right for you. Being an Executor of someone's estate is a huge and timely task. It’s a huge and timely task, especially for your loved one(s). 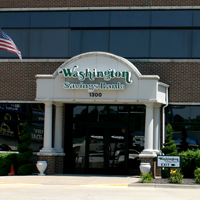 Our Trust Officers at Washington Savings Bank have many years of experience settling estates. We serve as Guardian of an individual's estate. We can basically do anything for an individual that they could do for themselves from a financial standpoint. 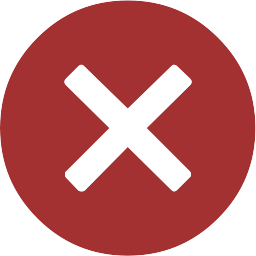 Investment and Insurance Products are: NOT FDIC Insured, NO Bank Guarantee, May Lose Value, Not a Deposit, and Not Insured by any Federal Government Agency. 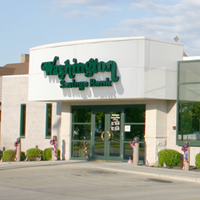 ©2019 Washington Savings Bank. All rights reserved.